On the Palm Sunday of 2011, we were traveling to New York City for my third piano performance at Carnegie Hall. I was extremely excited, not only for the few times in a life time piano performance at Carnegie Hall and a trip to New York, but I was excited because travel means CUPCAKES! So, on our way there, I was attached to my cell phone to search for the best cupcakery in the Big Apple! In my usual pre-cupcakery research online, I found mixed reviews about the “favorite” of New York City. 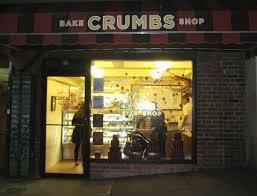 While Crumbs Bakeshop has grown from one shop to a large chain around the country in only twelve years, there were some happy and unhappy customers. I was definitely surprised. So, these reviews inspired me to take the trip from Carnegie Hall to Crumbs Bakeshop, off of Broadway, to see what they were all about. The entire family walked in. I looked around, talking to myself saying “Heaven. I’m in heaven.” The first thing to catch my eye was the extreme size of the cupcakes. They sell mini, signature-size, and jumbo cupcakes. I didn’t think it would ever be possible to make cupcakes bigger than Sprinkles Cupcakes!?! I guess the impossible is possible. After looking into the customer reviews and their own details about the cupcakes, I had already determined which flavors I wanted before we had even arrived at Crumbs Bakeshop. I planned to try the Apple Cobbler, along with my usual of the classic Red Velvet. I soon realized how the cupcakes were so large. It was because they were getting away with charging customers $3.75 per cupcake. That steep price did align with the size, when comparing it to other cupcakeries. The Apple Cobbler Cupcake was outstanding. It was an apple cinnamon cake with a filling of apple preserves, topped with vanilla cream cheese frosting and covered in streusel crumbs. That description alone manages to make your mouth water. It seemed as though the apples in the cupcake’s center were able to keep the cupcake moist, which was key. The Red Velvet cupcake was a bit of a letdown. 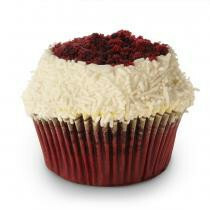 The actual cupcake was red velvet cake with rich cream cheese frosting, topped with red velvet crumbs and edged with white sprinkles. Although the cream cheese frosting was delectable, the sprinkles and cake crumbs over top of the icing didn’t do the cupcake any favors. The actual cake was a bit dry and did not live up to my high standards for red velvet cake. We visited in the late afternoon/early evening, so the cupcakes were probably made during that morning and had been sitting for too long, through the day. I was upset since we bought quite a few red velvet cupcakes since everyone in my family loves to eat them, and at the steep price of $3.75, they weren’t worth it! Although my main cupcake challenge involves testing red velvet cupcakes to find the best cupcakery, the Apple Cobbler Cupcake will definitely take me back to another Crumbs Bakeshop to try another flavor, somewhere in the U.S.A.